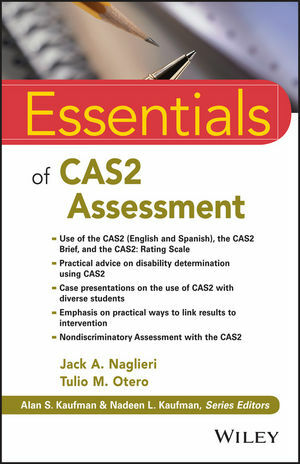 Essentials of CAS2 Assessment is a comprehensive guide to the successful administration of the updated CAS2. Written by leading cognitive assessment experts, the book discusses the latest research and thinking on PASS (Planning, Attention-Arousal, Simultaneous and Successive) theory and includes case studies that demonstrate the use of CAS2 with several types of diagnostic groups and integration with other instruments. A companion website offers additional tools and information to help busy professionals make optimal use of the CAS2. Each chapter in the book highlights key concepts, bulleted points, and actual test questions. The CAS2 is a valuable tool in the detection of learning disabilities, ADHD, TBI, retardation, and giftedness. Essentials of CAS2 Assessment is the guidebook professionals need to ensure the CAS2 test is applied and analyzed accurately so that the results can be applied to the maximum benefit of the child. JACK A. NAGLIERI, PHD, is Research Professor at the University of Virginia, Senior Research Scientist at the Devereux Center for Resilient Children, and Emeritus Professor of Psychology at George Mason University. With J.P. Das, he is well known for the PASS theory of intelligence and its application using the Cognitive Assessment System. TULIO M. OTERO, PHD, is Associate Professor at The Chicago School of Professional Psychology, where he teaches in both the school psychology and clinical psychology programs. He is a practicing school psychologist and consultant with a specialization in clinical neuropsychology, is past president of the Hispanic Neuropsychological Society, and co-author of the Spanish edition of the Cognitive Assessment System, 2nd Edition.